William Larkins (Larkin*) was born on May 20, 1833 in Ballinasloe, County Galway, Ireland to Thomas and Mary Larkin (Larkins?). Ballinasloe was a market town situated on the main road leading between Galway and Dublin and as such had a considerable carriage building history dating back to the mid-eighteenth century. Already an experienced craftsman, William emigrated to Massachusetts sometime near the end of the Great Potato Famine (1845-1952) and found employment as a carriage painter in one of Boston’s numerous carriage shops. On November 8, 1858, he married another immigrant from Ballinasloe named Sarah Nicholson in the Boston Suburb of Roxbury. Sometime prior to 1861 the young couple relocated to San Francisco where Larkins was listed in that city’s 1861 city directory as a carriage painter. By 1865 he had become the proprietor of Larkins & Co, makers of high grade carriages. The Larkins works was originally located on Sumner Street near Montgomery. He later moved the firm to 634-638 Howard Street between Second and Third Streets, where he remained in business up until the fire of 1906. San Francisco city directories also list William’s other business interests, which included an interest in a hostelry and drayage company. His carriage company also had silent partners, the first being George McCloud who is listed as a co-owner in Crocker-Langley’s 1889 San Francisco directory. The same source lists George McCloud’s home at 659 Howard St, just one city block away from the firm’s manufactory. The Larkins maintained a residence at 27 Dorland St.
During the late 1800s, the Mechanics Institute of San Francisco awarded yearly competitive medals for excellence in craftsmanship and between 1865 and 1900 Larkins were awarded four gold and nine silver medals. The firm’s advertisements included a wide variety of vehicles; Doctor's Phaetons, Ladies' Phaetons, Top Rockaways, Hacks, Coupes, Sulkies, Express Wagons, and Fire Wagons. On January 21, 1869 (1867?) the Larkins were blessed with the birth of a son, William Bernard Larkins (d.1942). William B. attended the Mission grammar school and also a business college. Even while in school he assisted his father in the latter’s carriage shop, obtained a most comprehensive knowledge of the work, and as a consequence gradually relieved his father from many responsibilities. William B’s younger brother, Thomas Henry Larkins (1877-1967), did not enter the family’s carriage business, deciding instead to go to a business college after which he enjoyed a long career in ranching and mining. On June 26, 1894, William B. Larkins was married to Elizabeth McIntosh, a native of San Francisco, California, and to their blessed union were born four children; Allan Thomas (b. April 28, 1895), William Burton (b. August 22, 1896), Kenneth John (b. July 22, 1902), and Marian. William Burton Larkins (1896-1958) - Sometimes known as Burt, or simply W.B., William Burton Larkins is sometimes referred to as Bertram with a different (1890) date of birth, yet an identical (Sep 8, 1958) death date. At the time of the elder Larkins’ death on July 6, 1913, his eldest son, William Bernard, had been in charge of the firm’s operations for some time. As his sons matured, they in turn became associated with the family business. Originally constructed in 1898 to house the streetcars of the Geary Street Park & Ocean Railway (GSPO), the sturdy brick structure was taken over by the San Francisco Municipal Railway (MUNI) in 1912 when they purchased the assets of the GSPO. MUNI leased the property to Sperry Flour in 1916 and in 1919 sold it to Larkins who remodeled it with a new stucco facade, renaming it the Larkins Building. In the new facility Larkins manufactured a small number of custom bodies for local high-end automobile dealers although refinishing and painting motor vehicles made up the bulk of their business. Other products included bus bodies, commercial bodies and wooden air-frame sub-assemblies. "Upholstery & Trimming Dept", "One of the Varnish Rooms", "Blacksmithing Dept", "Part of the Paintshop", "Office and Drying Room", and "Body Building Dept". The 1915 San Francisco Directory lists E.V. Williams as an owner of the firm. His exact involvement with the firm is unknown, however prior to that time Williams, who was a master blacksmith, had been associated with the vast naval shipyards located north of San Francisco at Mare Island. The magnificent 1917 Fageol cars shown at the Chicago and New York Auto Salons featured coachwork by San Francisco’s Larkin Co and Chicago’s C.P. Kimball. One unusual feature of the Oakland, California-built luxury cars were their solid-ivory door handles, but only 3 of the $15,000 motorcars are thought to have been built. During the late teens W.B. Larkins served as president of the Automobile Body Builders' Painters and Trimmers' Association. At about the same time the firm debuted the Larkins Top, a handsome, sporty, cut-down convertible top that was especially popular with owners of Packard roadsters during the early Twenties. Larkins designer, August H. Pape of Kentsfield, California held a number of patents for automobile tops which were assigned to Larkins. 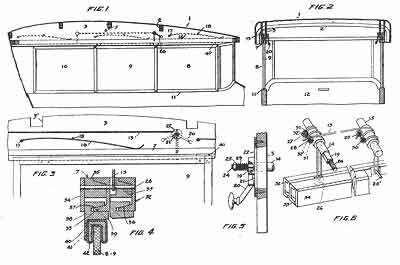 The first, a “means for converting collapsible tops of automobiles into closed tops” was originally filed on October 27, 1919 and granted on December 28, 1920 as patent #1,363,908. It was reissued on April 29, 1924. On November 11, 1919, Pape filed a patent for a ‘window fastener’, patent # 1,530,909 which as eventually granted on March 24, 1925. 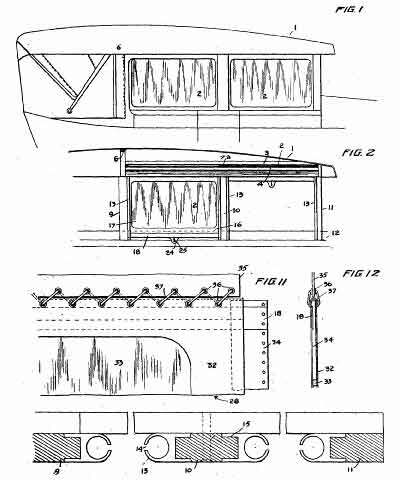 Pape’s next patent, #1,488,827 (filed June 8, 1920, approved April 1, 1924) was for a ‘sliding side window’, the principal design feature of what would be soon popularly known as the Larkins Top. The daylight factory was the aforementioned former Geary St. 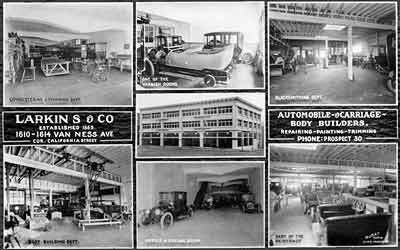 Car barns, which were located at 3700 Geary St. at the corner of First Ave. Geary St was originally called Point Lobos Ave, and First Ave was eventually renamed as well and is now called Arguello Boulevard. 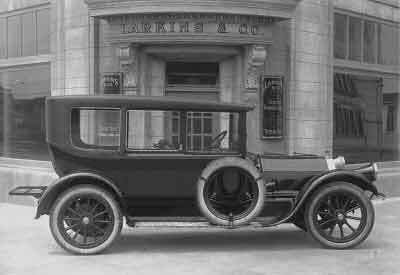 Pape’s most famous creation, which was to become the ‘Larkins Top’ (automobile top, patent #1,563,287), was originally filed on Feb 16, 1921 and granted on Nov 24, 1925. Pape also submitted a design for an “automobile side curtain” (patent # 1,563,288) which was submitted at the same time. A Canadian patent (CA 218978) for the device was issued on May 23, 1922. “Now that winter weather, is approaching, the open car cannot be used with the comfort that is the case during the summer months. Rain and wind are in the making and there is very little pleasure in motoring, according to Allan Larkins, of Larkins & Company, in a drive that includes chill and the discomfort of driving moisture. “Among the exhibits which have been attracting the most attention at the California Industries Exposition, being held at the San Francisco Civic Auditorium, is a display made by Larkins & Co. of the top, which is manufactured by this concern at its local factory. “The exhibit consists of the showing of two tops, both of actual size. One of the tops consists simply of the framework showing the kind of high class material that is used in construction and the manner in which the top is put together. The second top is one that is fully completed, showing the leather covering, the plate glass windows and the patented spring pressure track which renders the top absolutely rattle-proof. 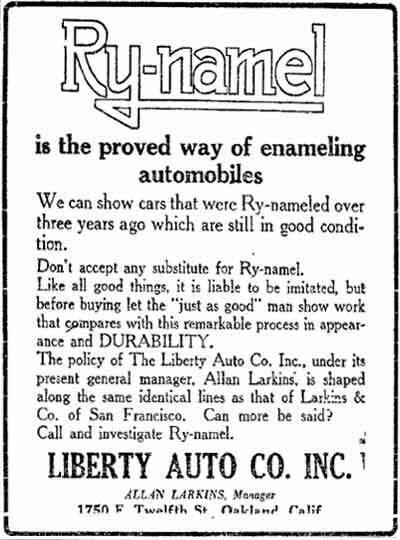 On July 15, 1919, John A Rymer, the manager of Oakland California’s Liberty Auto Co., filed a patent application for an improved process of enameling metal and wood surfaces. The approved process, patent # 1,406,498, was an early-sprayed-on celluloid-base enamel (applied over a lacquer and white-lead base) that was marketed as Ry-namel, in honor of its inventor. 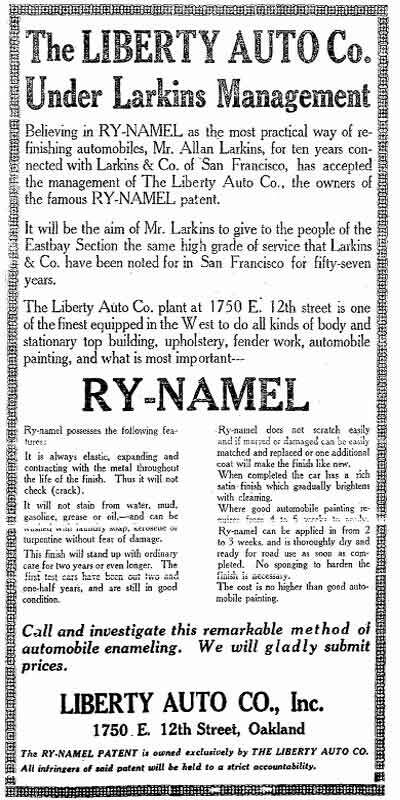 In late 1921 Allan Larkins took over the management of Liberty Auto, located at 1750 E. 12th St., Oakland, acquiring the rights to the Ry-namel process in the transaction. Soon afterwards, Larkins’ San Francisco operation was heavily advertising the new spray-on enamel Ry-namel process. This fact the firm capitalized on in their regular newspaper advertisements in the San Francisco Examiner and Chronicle. They advertised their “Larkins Duco Finish” in the San Francisco Auto Salon catalogs, but it’s unlikely that they exhibited any coachwork at the annual event as by that time their main business was body refinishing, not building. All three Larkins Brothers were busy at the firm - Allan in charge of sales, Burt in charge of the body shop and Kenneth who headed the firm’s expanding auto service and repair department. “In August 1927, Whittell accepted delivery of a Rolls-­Royce Phantom I chassis from Springfield. The Phan­tom I was then a brand-new replacement for the American Rolls-Royce Company's Ghost. To finish the car, Whittell hired a coach builder from England to de­sign and implement a custom body, working at Burt Larkins Specialty, a small shop on Geary Street in San Francisco. The coach builder created an odd coupe with two comfortable seats in the front and a cramped one in the back; its abbreviated cabin left 3 ½ feet between the rear wall and the bumper, a space that was filled by a portable trunk. Whittell stopped in the Larkins work­room to inspect the work as it progressed, but when the final result was delivered to him, he had it parked with­out driving it, without sitting in it, without even looking at it. He then bought another Phantom I chassis and hired a body builder from Germany to work at Larkins on another custom body. This one took 3 ½ years to com­plete. The coach builder changed his direction regarding the car three times, something which the single-minded Whittell did not appreciate at all. "We knew they were coming to deliver it the next day and we went downtown to buy sledgehammers and axes," Kuboski recalls. "Burt Larkins and the body builder drove in with it and the Chief looked at it-never even looked inside-and said, 'Okay, boys. Tear her up. It's nothing but a God-damned piece of junk.' The body builder was standing right there. He passed out." Another 1931 trade publication noted that Larkins paint shop was “one of the largest in the country”. 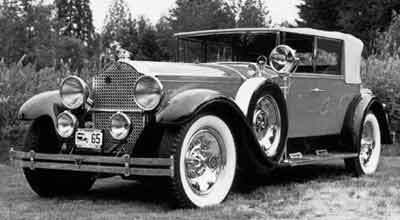 During their short time in the custom body field Larkins is known to have built on Chevrolet, Fageol, Marmon, Packard and Rolls-Royce chassis. At least two vehicles are known to exist that bear Larkins name plates. One is a 1929 Packard 640 convertible sedan (Chassis No. 171988) that was sold at Christies’ Pebble Beach auction in 2001. The late Packard coachbuilding historian Hugo Pfau was familiar with the car and believed that in reality it bears a re-badged Murphy body as it featured the Pasadena coachbuilder’s distinctive cast aluminum door posts and clear vision styling. 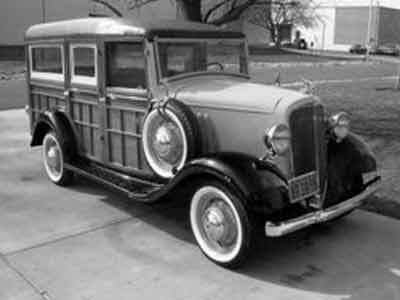 “This 9-passenger wagon features an ash body, roll-up front windows, tan cloth and plastic windows that snap in place. Power is supplied by a 206.8 cubic inch six producing 60 horsepower, driving through a 4-speed manual gearbox. This remarkable wagon comes with a plethora of documentation including photos of the car prior to restoration, comprehensive ownership history, 1940's wartime license and fuel permits, repair manual and was featured in the book, "Woody" by David Fetherston. A magnificent ground up restoration that is fully documented, this handsome estate wagon is finished in light tan with black fenders and orange wire wheels. The interior is appropriately done in brown leatherette. The top is the correct black fabric. " During the depths of the Depression MUNI re-occupied the top floor of the Larkin building for use as a bus storage depot. As the economy rebounded, the first floor paint shop was slowly converted into an automobile repair and service center which did business as the Kenneth Larkins Company. “The entirely new exhibit in the Ford Building on Treasure Island this year is proving a magnet that is daily attracting larger crowds as most of the many new and interesting features is being spread by word of mouth by the thousands who have visited the exhibit. Historic old vehicles from the horse and buggy period intrigue the youngsters at the Fair and arouse the keenest interest from the old timers. 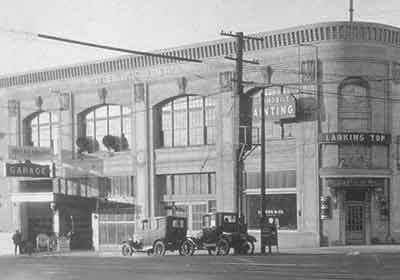 After World War II, the Larkins Building was converted into an automobile dealership, the very first on Geary St’s Auto Row, which ran from Arguello to Eleventh Ave. 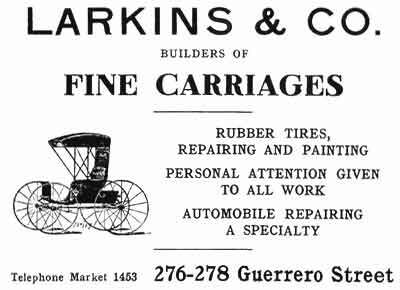 In 1950 the next generation of Larkins established Larkins Brothers Tire Shops at 370 S Van Ness Ave. That firm was recently reorganized as Hanlon & Larkins Brothers Tires Company which maintains another branch (Hanlon's Tire Service) in San Bruno, California. Today the original Larkins building located at 3700 Geary St. is an Office Max, the only one in the country with the convenience of parking on its upper floor. Lewis Francis Byington - History of San Francisco, S. J. Clarke Publishing Co., Chicago, 1931. Vol. 3 Pages 114-116. Are you paying too much? Make sure your auto warranty covers your entire vehicle. State by State directory of car shows; includes new car shows and classic auto events. Paying too much? Use this step by step guide to help get the best deal on your next car. Your one stop shop for automotive books, models, die-casts & collectibles.